July 28, 2018/Scott Hutcheson/Comments Off on Is Your Landscape Dancing? When we first began testing out Strategic Doing we were looking for use cases anywhere. We had a hammer and everything looked a whole lot like a nail. In those early days we probably tried to use Strategic Doing at times when it might not have been the right tool for the situation. In many complicated situations the landscape isn’t dancing. There might be a dance involved, one with complicated choreography but you can learn the dance. The hardwood of the dance floor is solid and stable. The rules of the game are not being changed as you are playing the game, to switch metaphors. A situation is complex when the ground is shifting underneath your feet, when what might happen next week is difficult to predict much less five years from now. Together with one of our colleagues at Fraunhofer IAO, Nino Ardilio, we came up with this graphic. Okay, we “talked” and Nino drew. It perfectly describes this notion of a dancing landscape. 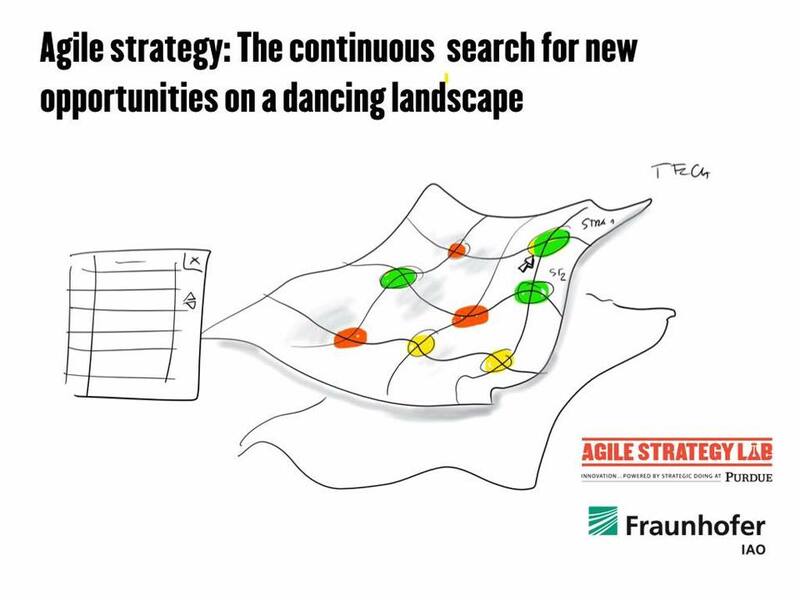 Some of us are constantly looking for new strategic opportunities on a dancing landscape. Those green high spots are where we think the opportunity is; but by the time we get there, the landscape may have shifted and that’s now a low spot. How in the world do you strategically plan for that? You don’t. You need a more agile approach to your strategy. That’s our sweet spot. So…is your landscape dancing? 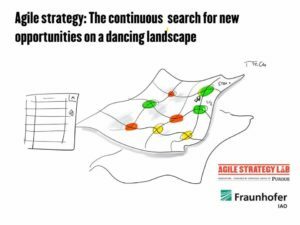 If it is, you’ll need an agile approach to strategy as your dance partner. ← Jumping the Curve: How Do We Do That?